So the other day I came across a recipe (Egg and Sausage Muffin) and I was like, “Hmmmm, that sounds yummy! Too bad I don’t have sausage on me right now. I know, let me try it with ham.” And so I did. You’ll need some ham – not too much. Milk – not too much, just enough to make the eggs creamy. Spray 6 portions of a regular muffin pan. 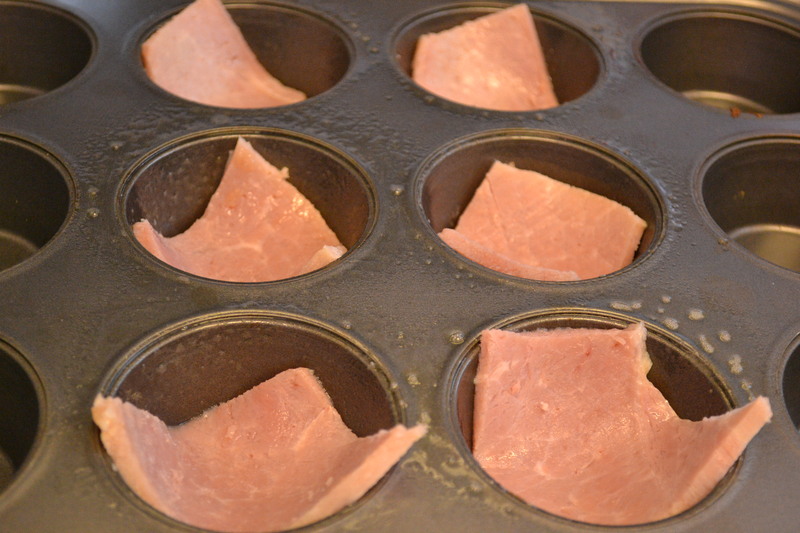 I took 6 small pieces of spiral sliced cut ham (approx 0.8 oz) and placed each one in a portion. 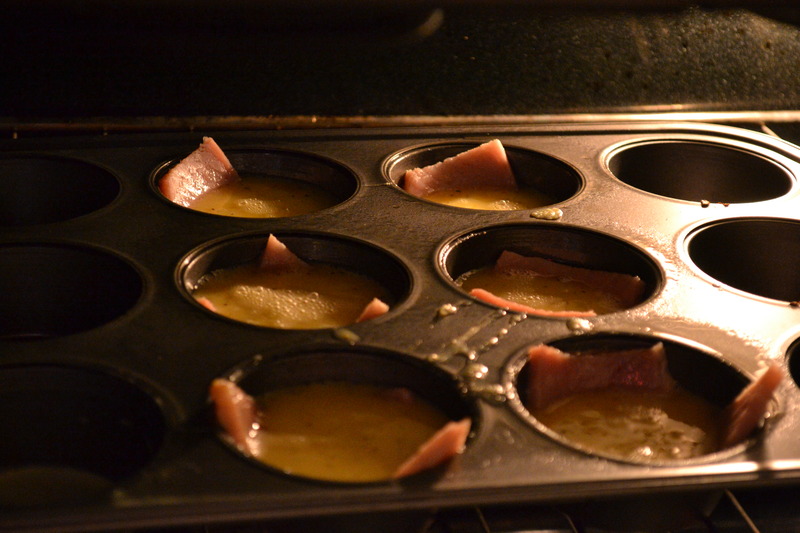 After scrambling the eggs and milk, I carefully put some of the mixture over each of the ham slices. 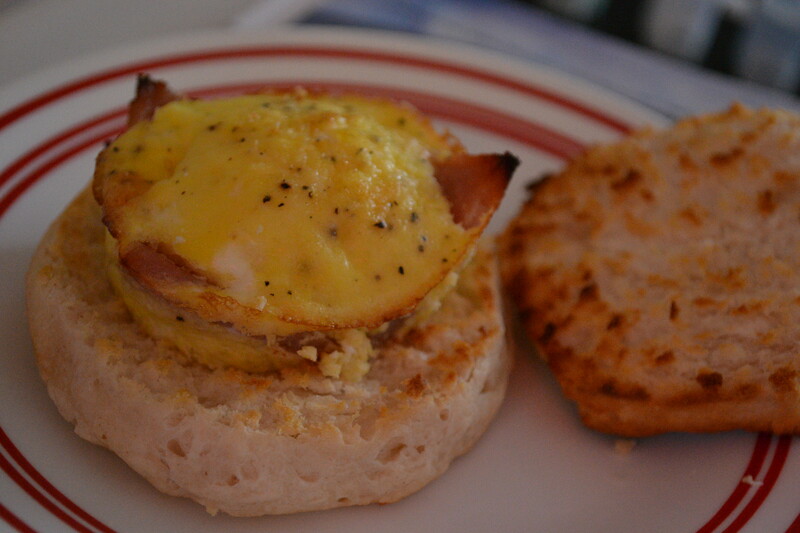 I also decided to cook some biscuits and have them with my ham/egg combo. Leave a comment Posted in FOOD! So today I start my new lifestyle change which actually has a name: WeightWatchers. My mistake today was ordering a Chik-fil-a sandwich and large Dr Pepper and cookies from McDonalds. I admit, it was a weak moment but I hadn’t eaten all day (which isn’t a good idea, btw) and I had just finished grocery shopping. My love though, is cooking. I was going to make turkey chili but after realizing that the turkey had gone bad, I decided to make my new favorite, chicken and rice crockpot soup. 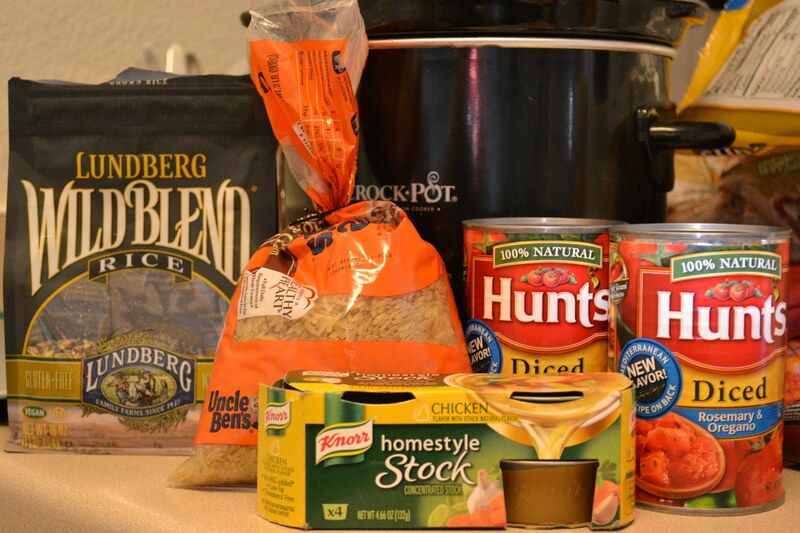 Shown above, are the ingredients for the soup except the chicken (I usually use about a pound – I like my chicken). I just throw them all in the crockpot and let it cook. Add all ingredients and cook on high for as long as needed. At about two hrs, scoop out the chicken and either dice/cut/shred and then put it in. All done and measured out – doesn’t that look yummy?? All 7 servings in the fridge for the next week – yay!! The serving size is approximately 15oz or 1/7 of the whole thing – remember that. What should I write about? What do I decide is important enough for me to write about and also important enough for you to read about? Are my daily struggles worth putting into words to share with you? The world? Do you really care? Is it worth it? Is it?? A lot of people when they hear this tend to think the worst. They think of the cutters, the one who take their own lives and the ones who stand out from the crowd. But what about the ones who struggle with it? The ones who manage to convince everyone that they’re fine? Those are the ones who struggle the most with it. I know because I am one of them. I struggle with depression on a consistent basis and yet, I don’t think many people know. I smile and act like I’m having fun but everyday I go home and I see how empty my apartment is and I start to struggle with those feelings. I never want to cut myself but I wonder what life would be like if I didn’t struggle with depression. True, there are days when I’m fine but then there are days when it’s all I can do to sit and cry and eat. I know that I’m rambling but it’ll make sense soon. Maybe. One day. I’m tired and I’ll do better tomorrow at this blog thing. Night. …..And the struggle I face. It’s an everyday, constant struggle. As I type this, I am watching an American Dad episode where the dad thinks that he’s too fat and decides to become anorexic and bulimic and it makes me wonder, how much of this do I believe? Do I think that I am fat when I’m not?? It doesn’t help that the Navy tells me I’m too fat for my height but how much do I believe of it to be true?? Every single day, I am faced with a choice of what to eat and unlike everyone else, fear drives me. Fear that eating the wrong thing will result in me gaining too much weight or that the opposite will happen and I’ll become anorexic. That fear is soo strong it’s almost ridiculous. I know I already mentioned my fear and how I struggle with it but what I didn’t mention is that I also struggle with depression, but that’s gonna be a different post. I’ll relate them in a different post. First off, I didn’t post yesterday but oh well. Second of all, I am sooo frustrated with a coworker. Let me explain. I work in communications and except for me, everyone is a gamer. I don’t mind playing games but I’m not a gamer by any means. I have gotten teased on for it a few times by everyone but this coworker is something else. He constantly pisses me off. He can’t be wrong and has to have the last word in any conversation we have. I cannot understand this guy sometimes!!! Last of all, I have two days to lose two pounds and I’m worried that a) I won’t be able to, or b) I’ll lose the weight and start becoming anorexic so it won’t happen again. I don’t want either to happen. I really want to pass so I can say I never failed a weigh-in and so I can get orders to Norfolk. That’s all for now in terms of griping and complaining. In other words, I had a friend from class show me some things to do in the weight room in terms of upper body and it was cool. I finally had someone to show me some things I can do without being worried that I am doing them wrong. It’s cool. My arms are gonna be so sore tomorrow. This is something I need to do. I need to write about my struggles and what I feel and what’s been going on. I don’t care if anyone reads these posts but it’s gonna be nice to get stuff off my chest. I am currently waiting to see when I will be getting new orders. My detailer is trying to get me new orders to Norfolk so I can be with Josh. Granted, I might be on a ship but I can still come home to Josh and be with him instead being 1500 miles away. I haven’t really taken any pictures lately. I haven’t been inspired. I’ve also been battling depression which makes being apart from Josh even harder. Before I go any further, I need to refrain myself. I’m saying the same things and nothing has changed. I need to figure out how to cope. It’s gonna be hard but I hope that I can do it.